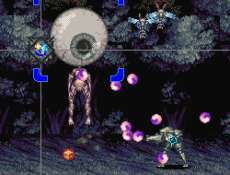 This is an action game that is reminiscent of arcade classics like Cabal and Blood Bros., in which the player has to dodge swarms of bullets while shooting back at enemies at the same time. It was made with Shooter Maker 95 and won Tech Contest Park Fall 2007 Gold Prize. Hold the Z key to shoot, and use the X key for special moves such as double jumps or dash. The default control scheme can be switched easily during combat. Items are collected automatically when your character isn't shooting at enemies. Orange items restore health, while blue ones increase your secondary weapon charge and time limit. Swap between both weapons by pressing the X and down cursor key. Bullets can be slashed by tapping the Z key rapidly, This only works on projectiles with a purplish tinge and not the ones which are blue in color. There's a certain balance to maintain as shots weaken after prolonged use, so switching weapons regularly can be vital to maintain health and increase the time limit. A small hit point will appear when the Z key is held down. The final boss requires a certain strategy to beat, and much like Buster's Vacant Ark multiple endings are included for each of three difficulty levels. On “Normal” and “Hard” difficulties, you must manage your usage of the two weapon types. Using one repeatedly will weaken its strength, but also power the other weapon. Use 7-Zip to unpack the files, and JoyToKey for joypad support.